Can't complain about these tubes. They work as expected and for very cheap. Why pay more for inner tubes? Great price and fine quality. Always using this as a replacement, performance wise same as branded ones. Good tubes at a great price with fast shipping to the US. Would recommend this to anyone. Good value! Not a racing inner tube, but great for training and general riding. I had to order these to fit my 28mm Continental GP4000s II tyres. So far so good. They hold the inflated pressure well over several days. Good product, great price, super service. Solid, budget inner tubes! Not terribly light, but well made. Shipping to Virginia, United States was much faster than expected. The tubes are standard quality at a great price. I carry them as a backup for my tubless setup I will be recommending merlincycles to my fellow cyclists! Even with new tyres I'm not immune to getting punctures and today less than a week after putting on new tyres I managed to imbed a sliver of glass in the rear tyre and replaced the tube with one of my new Standard Presta Valve inner tubes. The changeover went smoothly and I had no problems for the rest of the ride. My new tubes were in addition to the ones that came with my new tyres and they too were quick and easy to order and were delivered with my new tyres. Good inner tube, fits well. One thing I noticed is that they hold the tyre pressure well. I've had other inner tubes that seem to lose a fair bit of pressure in a single day. I received the tubes today. I have not used any yet but having had 7 punctures in the last two weeks I am sure I will. These tubes are much thicker than the ones I currently use. This is good for me as maybe they will be a bit more puncture resistant. I am ordering more! FYI: It took 14 days from the time I ordered these to receive them In Mobile, Alabama. A little heavier(135g for 60mm valve tube), but looks very sturdy. Will be used on winter bike, so weight is not an big issue for me. Good so far, have only used one and installed on wheel 500 miles ago. I have not use from this purchase but I have bought and use them before and work great for commuting . Good value inner tubes, being used on my commuting bike and no problems at all. Maybe not the lightest but that doesn't matter on a commuter bike. Recommended! A basic standard inner tube with presta valve. You cannot go wrong with these if you choose the proper length of valve. What can you say? Reasonably cheap and beyond checking the pressures once a week have not caused me any problems. Great price on durable tubes. I will not be using them unfortunately due to the thickness and weight of these mothers! I have to roll them and fold the last portion just to fit them into my bottle storage and I tight roll them so theres no air in them at all!, bummer cause I bought 10 of them in two different size stem lengths (60mm and 80mm). I usually use standard Kenda tubes, those are super lights compared to these mammoths and take up about 55% of space that these do. Wish someone really put out how much bigger and heavier these are then your standard tube, I don't have my scale on me but they feel twice as heavy no joke! I guess I'll use them for friends who have blow outs on the road when they don't have any left, thats all I can use them for. As always Merlin rocks! Good service in the delivery, only used one so far, seems quite heavy, but perhaps more resilient. 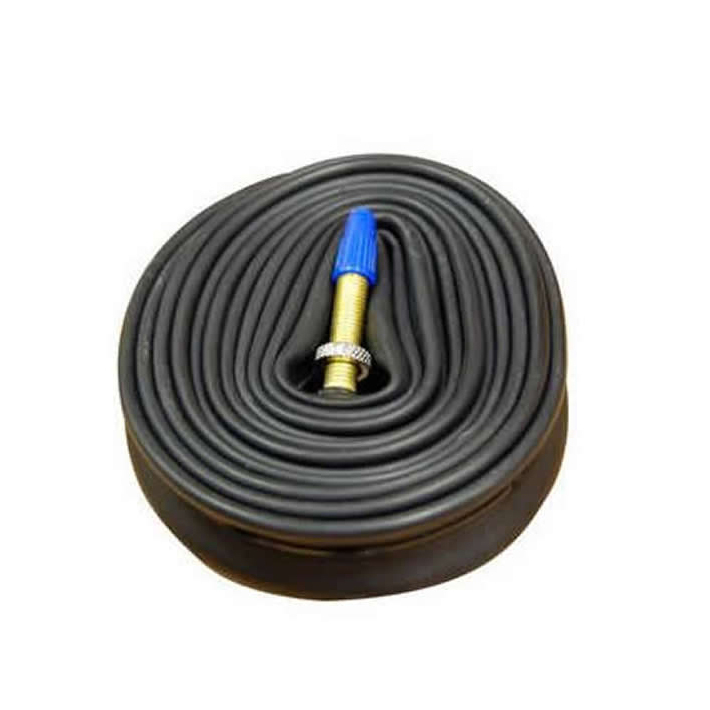 Good basic inner tube, at a cheap price. Purchased as a back up, so luckily have not needed to use them as yet. However, after 30 years using tubes, I have no doubts about their suitability. Light, good tubes - no complaints. Decent Tubes for the price. I haven't flatted yet! It's round and rubber. No leaks yet. What more can you ask! Great service from Merlin as usual. Looks like these are as good as more expensive tubes. On	first couple of weeks no problems. Brought these in bulk. I have found them to be better than expected not losing as much air as other I have used. A great price. Great value for money product, Appear to be as good as tubes twice the price. Holds air well and looks high quality. It's a tube, the quality is good, what more could I need. These are generic, 100% butyl rubber tubes. They appear to be equivalent to a Specialized thin tube. They are far from heavy, but will likely not provide much puncture resistance in the event that material is able to get through your tire. If you are looking to shave a little weight and you need a tube that is on the skinny side, look no further. Great price, quick delivery, not exciting but vital ! Nice rubbery feel to them. They inflated fine. This is a good solid inner tube. Performs as expected, with a very good price. A great value. These are a nice quality tube and seem to be more "rubbery" than a lot of inner tubes that are on the market. They also seem to hold their pressure better and for longer. 500 miles so far with no problems. Tubes arrived very timely. Tubes look same as tubes purchased at LBS for a lot more. So far I have 200 miles on 1 tube with no issues. Would purchase again. Good inner tubes. Seems to hold pressure longer than the other tubes I have had. Good tube, no punctures yet. These are your standard presta butyl rubber tubes. What I like is that the stem and valve are colored black. They are CSTs which are good quality. Would definitely buy again. Does what it's supposed to do at a decent price. Feels a bit heavy, but that's not gonna bother me this winter. Good tubes, I use these rather than fixing punctures ! Good price, quality looks fine. Not the lightest but also does not look too fragile. No issues so far. Got the same tube on another bike, it's been over 2000 miles, no problems so far. We were really impressed with the quality of this tube, it is a thicker rubber than I have used in the past when I have bought one from the Gold Coast, the price was amazing as well, we will definitely keep purchasing from this supplier in the future. I've been using this tube in the front wheel for more than 2000km, got just one puncture but it was a piece of sharp and thin metal which would pierce anything. I repaired it and it was ok again....so far.